Lake Stewards: Aquality’s small, specialized team goes for big local impact. As a kid growing up on a farm in southwestern Ontario, Jay White cultivated an interest in spring floods, hydrology, and wetlands. As an adult, he puts that passion to use at Aquality, an Edmonton-based boutique consultancy that provides a wide variety of projects related to water quality and fisheries, from lakes and wetlands to rivers and streams. 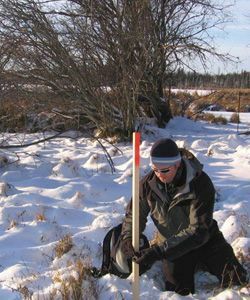 Since 1999, Aquality has worked on several of Alberta’s watershed management plans, including Lac La Biche, which won a 2007 Canadian Geographic award in environmental health for its watershed steering committee’s work. “When we started working with Lac La Biche in 2004, they had no environmental staff, no GIS, and the planning was rudimentary,” says White. The Aquality team started by implementing Lakewatch, an Alberta Lakes Management Society program that involves the community in water quality testing and results in a water quality report for the lake. Since then, they’ve completed a state of the watershed report, a watershed management plan, and developed several policies including wetlands, environmental reserves, and environmental economics. In addition to being heavily involved with watershed groups and the development of municipal riparian policies, Aquality has developed a wetlands policy course for environmental professionals. The team’s Riparian Setback Matrix Model is another major accomplishment. A scientifically and legally defensible model, it can be used to establish setbacks for development, determine the size of environmental reserves, and the size of environmental reserve and conservation easements. It has already been incorporated into the bylaws of Lakeland County, and is currently in development or approval phases in the M.D. Foothills, Leduc County, and Sturgeon County.